Um, maybe you should stick with fresh spinach. If something works for me, I stick with it, even if it sometimes seems a little weird. Earlier in this culinary adventure I turned one of my favorite salads, the Caprese (visit post)—a traditional Italian dish consisting of tomatoes, basil and mozzarella cheese—into a soup. It turned out great. This time, with spring officially upon us, I went back to the cutting board and found inspiration in another of my favorite salads. 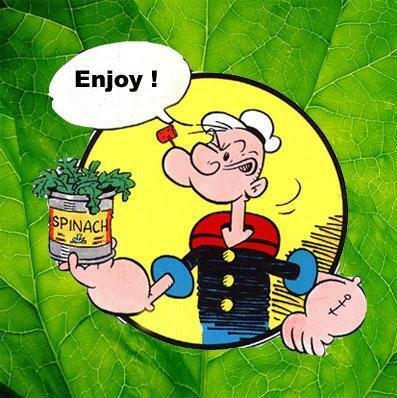 Unlike the Caprese, my Warm Spinach Salad is rich and full enough to be served as a main course. Would it be able to make the transition from salad to soup bowl? I sure hoped so. My wife did not have such high hopes. When she brought the kids home from Chinese class that night and I described dinner to her, the dish that brought the gimace to her face wasn’t the apple blueberry pie with green crust. (Happy belated St. Patrick’s Day!) It was the spinach salad soup. Uh-oh, I thought. I’m in for it now. The strange thing is my wife loves this salad. We’ve been making it for years, in all seasons. It’s an especially popular choice for dining alfresco. Perhaps that’s what drove me to take this leap. Perhaps I was so eager for winter to be over that I decided to take our dinner outside, at least subconsciously. Make no mistake, we weren’t about to set up shop on the patio, even though the 40° weather felt almost summery compared to the freezing nights we’d had up ‘til then. Whatever my inspiration, by the time I saw the revulsion on my wife’s face, the meal was already too far along to turn back. I had already sautéed the mushrooms and onions in the olive oil. I’d already fried up the bacon and whisked in the mustard and balsamic. I’d already simmered the spinach in the stock. All that was left was to cut up the tomatoes, dice the avocado and add the goat cheese. The key to the salad is to dot the spinach with crumbled goat cheese and then toss the warm mushroom dressing over the rest of the ingredients. The warmer part of the salad not only wilts the spinach slightly it also softens up the goat cheese to create small pockets of intense flavor in almost every bite. With the soup, I thought I could recreate the effect of the goat cheese by setting a round pat of the cheese on top of each serving so it would melt into the broth without dissolving. Instead, the soup was a success all the way around. Well, almost. Although one daughter liked it, the other one didn’t really give it a chance, because she “hates” goat cheese and spinach. Apparently, the avocadoes, which she loves, weren’t enough of an enticement. Add the stock to a 3-5 quart soup pot, bring to a boil then reduce to a simmer, add the spinach, cover and continue with the next step. Warm up the olive oil in a medium skillet, then add the mushrooms and onion. Sauté over medium heat until the vegetables are soft. Add the bacon (or use veggie bacon for a meatless alternative) and continue sautéing until the bacon is cooked. Add the mustard and vinegar and whisk together the ingredients in the skillet until they are well mixed. Add salt and pepper to adjust the seasoning to your taste. If you were making the salad, this would be your warm dressing. Add the dressing to the soup along with the tomatoes and avocado and heat through for 5-10 minutes. After you ladle the soup into serving bowls, place a pat of goat cheese in the center of each bowl and serve immediately. I served it with herbed salmon and snap peas. The green pie was for dessert. FYI: For best effect, don’t stir the goat cheese into the soup. Instead, trap a little bit of the cheese into each spoonful of soup. Image Credit: “Strong to the Finach” borrowed from the public domain by the author. What other salads do you think would translate well into soups? Salad Niçoise? Waldorf? Caesar? Only the Caesar actually fires my imagination, but who knows. Let me know what you think and what direction you would like to see the soup blog go in. Leave me a note, as ever, in the comments. Your spinach soup sounds great, it’s a must try for our house. I was wondering how our left-overs from our annual St. Patrick’s day meal would work in a soup. We never finish the boiled cabbage, potatoes, carrots or corned beef. What do you think? I just wanted to say, I really enjoyed your blog post and I added your link to my wordpress blog today as a recommended site – Blessings Debra! OK OK I was skeptical at first. Mostly, I couldn’t believe the Soup Blogger wanted to improv on my beloved Spinach Salad, which by the way, was used as a wooing technique way back then. But the soup was great, I have to admit. However, if he tries to make a soup out of my Grandmother’s slaw I might not be so nice.